Grey is the only way to describe the morning hanging over Hampton Downs Motorsport Park. However, the noise emanating from the Club Circuit is anything but — a deep-chested mechanical bellowing that thunders over the area. Hampton Downs is far from flat, but whatever natural sound barriers are in place aren’t doing much. The reason for the ruckus is ‘Fanga’ Dan Woolhouse, one of New Zealand’s longest-serving members of the competitive drifting community, and widely regarded as one of the best drifters in New Zealand. 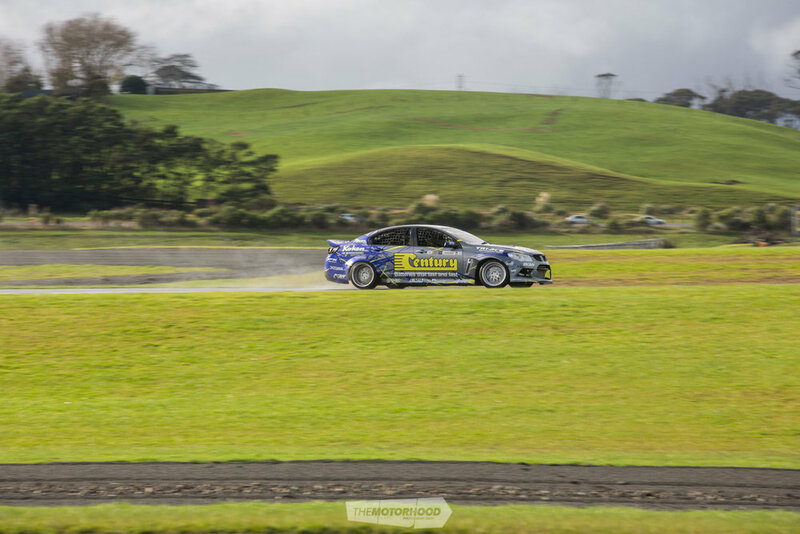 With the end of the 2017–18 season of the Demon Energy D1NZ National Drifting Championship, Fanga welcomes the off-season with a ‘fun day’ of sorts, thanking his crew and sponsors for their support by giving them the chance to experience a ride in his all-our VF Commodore war machine. “He’s been doing this since 8am,” says Dan’s partner Nicole. “I hope the people up there in the apartments don’t mind.” It’s unlikely they will — after all, sights and sounds like this are the reason people want to live trackside at Hampton Downs, and Fanga isn’t taking it easy, either. From the beginning of the day, members of Fanga's crew, as well as team members from Autolign, BG World Wheels, Frankensignz, and a bunch of other sponsors hang around to watch the action, and wait for a turn in the shotgun seat. The VF Commodore sounds brutal from outside, especially when Fanga really stands on it, sending the revs right up there, but from inside it's a whole different kind of loud. Despite being a full X-Force exhaust system, the lack of any kind of insulation and immense power produced by the Vortech-supercharged L98 means it's incredibly loud when Fanga gives it the beans. His car control is brilliant, and it's obvious that he's not only a very talented driver, but genuinely enjoys doing this. The damp track surface means he can’t go all out, and when the track begins to dry out around 11am, he takes full advantage of the extra grip by really standing on it. With each extra lap, it seems that more smoke pours off the rear tyres, and the tone of the big V8 steepens in anger as more is demanded of it. Fanga’s cool as a cucumber, though — even though he’s been in the hot seat for a few hours, he is like clockwork. The inside of the car is pretty hot, and so are the mandatory race suits, but he’s in the zone. You’ve got to be damn committed to spend so much time arm-wrestling such a machine around a circuit, but when you love drifting as much as Fanga does, it’s just another day in the best office on the planet. We’ll have a full feature on Fanga’s VF Commodore in a future issue of NZV8, but for now, you can check out the video below, where we strapped our esteemed photographer Adam into the passenger seat. Now you’re done with that, you can check out some of the car’s mechanical specs below, and get ready for some high-definition, non-pixellated video that we’ll have to go with the feature article. Nowhere is safe: Ken Block finally unleashes full mayhem in Gymkhana Ten!